The state DEC issued a permit for a resident to hunt on his or her property even when the hunting season ends, which the concerned resident said could endanger children and others unaware the permit is in force. An Asharoken resident has called on officials to prohibit deer hunting in the village in the wake of a state Department of Environmental Conservation decision to issue a deer damage permit to a resident to hunt deer on his or her property outside of hunting season. Nadine Dumser said at a board of trustees meeting that the permit endangers residents who may not be aware of the offseason hunting on the property, including children walking on nearby roads to and from bus stops. “The biggest problem is the mayor and the board are not really attentive to the danger, and the way that the residents and the property owners are having hunting in such close quarters,” Dumser said. The regular deer hunting season in Suffolk County was from Oct. 1, 2017, through Jan. 31. Deer hunting is not permitted in Nassau County. Mayor Greg Letica declined to comment beyond citing state law that municipalities must comply with regarding hunting on private property. The deer population in Suffolk County has grown in recent years and can pose a threat through disease and vehicle collisions, according to DEC officials. In 2016, Letica mulled creating a village code to require a deeper setback for bow hunters from neighboring property, but the idea was abandoned due to what he said was a lack of support. Huntington Town passed a measure in 2015 allowing bow hunting on private property with the owner’s consent. A DEC spokeswoman said one deer damage permit has been issued in the village, but she declined to identify the permit holder or the address of the relevant property. “The New York State Department of Environmental Conservation (DEC) issues Deer Damage Permits (DDPs) with strict conditions to protect communities by alleviating the negative impacts of high deer densities, including damage to farms, gardens, and forests and threats to human health and safety,” DEC spokeswoman Erica Ringewald wrote in an email statement. Asharoken village officials cannot enact laws over the DEC’s policies for private properties, she added. 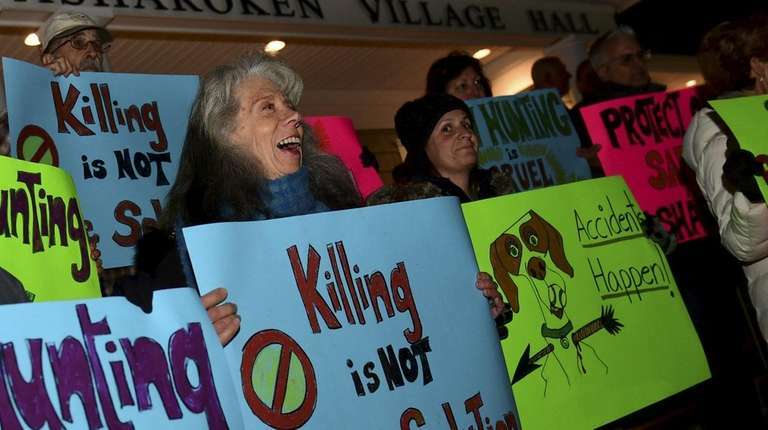 “DEC regulates hunting in New York State. A local municipality may regulate access to properties they own for any purpose, including hunting, but do not have the authority to regulate hunting on private properties,” Ringewald said. The deer damage permit has several conditions, including the number of deer permitted for hunting, areas where the hunting can occur and dates of usage, according to the DEC. The permit may allow for use of bait and hunting at night. Dumser said she finds deer hunting dangerous and intrusive and wants it eliminated from the area altogether.